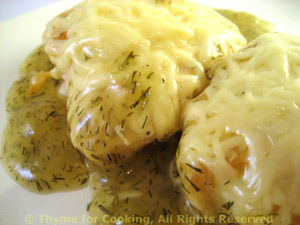 Cheesy Chicken, Thyme for Cooking easy midweek main course. Melted cheese tops this chicken with a light dill sauce - comfort food. Cut the chicken breasts in half for a nicer presentation. Heat oil in medium nonstick skillet over medium heat. Add shallots and sauté until tender and starting to brown. Move to the side and add chicken. Brown well on both sides, about 10 minutes total. Add stock, wine, dill, reduce heat to medium-low, cover and simmer 10 minutes. Dissolve cornstarch in water. Add to skillet, stirring until sauce is thickened. Top chicken with cheese, cover until cheese melts, 2 - 3 minutes.